New research identifies the direct benefits to coral reef ecosystems and communities after invasive rat removal on islands. Islands only make up approximately 5% of the earth’s land mass but they are home to 20% of the world’s biodiversity and 41% of the world’s Critically Endangered and Endangered species. Invasive species are one of the biggest threats facing our world’s seabird populations today including invasive rats, feral cats, and goats. Invasive rats have historically been one of the leading causes of seabird extinction on islands and continue to threaten species around the world by predating on eggs, chicks, and adult seabirds. 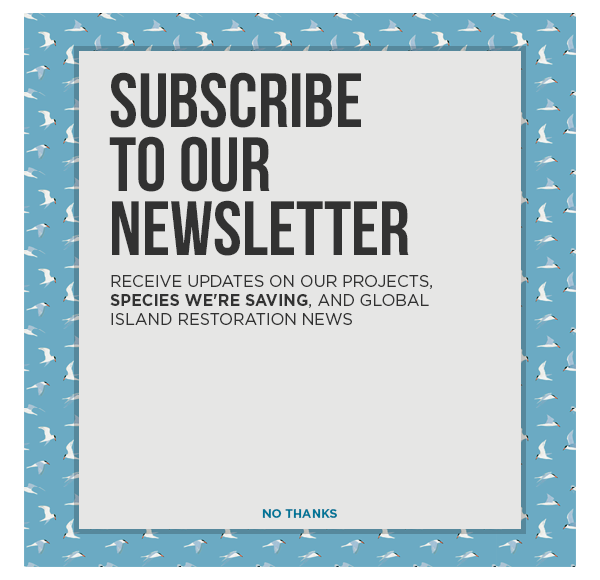 Past studies have shown that removing invasive rats from islands has a profound positive impact on native seabird populations. Following removal of invasive species, seabirds and other native species have been downlisted on the IUCN red-list or have avoided listing on the Endangered Species List. We now have concrete data that terrestrial and seabird species are not the only ones that benefit. A new study published in Nature quantifies the proven benefit to marine ecosystems, particularly coral reefs, on rat-free islands. Researchers identified 12 islands in the Chagos Archipelago, half of which have invasive rats present and half of which do not in order to study the effects invasive rat removal can have on near-shore marine ecosystems. What they found confirmed what many conservationists already suspected – marine species benefit from removing invasive rodents from islands. Seabirds spend the majority of their time in the open ocean, feeding on fish and only return to islands to breed. In doing so, they bring with them nutrients including nitrogen and phosphorus which fertilize native plants. Excess nutrients then trickle off into the ocean where it feeds the marine ecosystem. The balanced, natural influx of nitrogen and phosphorus to the marine environment adjacent to rat-free islands had astounding results. The coral reefs near invasive-free islands showed higher fish production and 48% greater biomass than their invasive rat-infested counterparts. Researchers found that Parrotfish, an abundant herbivorous fish which cycle nutrients through algal grazing, have been shown to graze algal ridges 9 times per year as opposed to 2.8 times per year near rat-infested islands. This new research shows that removing rats from islands is a win-win-WIN scenario with cascading benefits from native seabirds to coral reefs to human beings. By removing invasive rodents from islands, seabirds are given a chance to rebound, which leads to an influx of nutrients to near-shore marine ecosystems. Healthy coral reefs mean greater resilience against climate change and are vital to sustainable fishing and responsible ecotourism. But the benefits extend beyond just the island they surround – when fish have a healthy coral to protect them, they are able to grow large before venturing out to the sea. The science is in. Invasive rat removal must be a global conservation priority. This research was also featured on WIRED.